A bruise on your calf as the result of running can be disturbing, particularly if you experience other symptoms such as pain. Running-related calf bruising can be due to a variety of environmental factors and training errors. 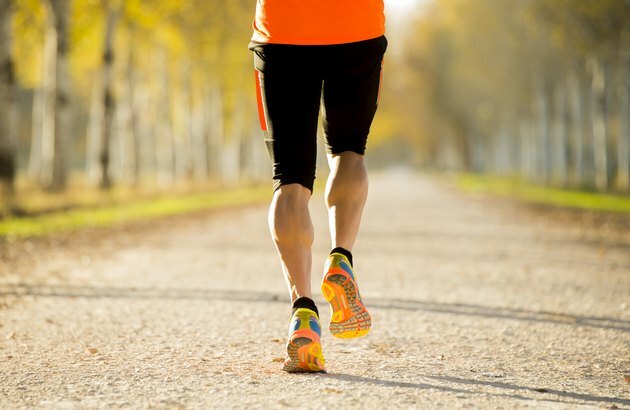 Because it can interfere with your running routine, it is important to understand what can cause bruising on the calf while running and how it can be remedied. Running-related calf bruising can vary from mild to extreme. It can be accompanied by a variety of additional symptoms such as stiffness, pain, tenderness, discomfort when you tiptoe or push off with your foot, muscle twinges, swelling, tightness, inflammation and aching. You can also notice a popping sound or sensation at the time of injury, New York University's Langone Medical Center reports. It can be difficult to walk or continue running due to calf-muscle instability or weakness. You can develop a bruised calf if you overuse the tendons, muscles, cartilage and ligaments in the calf by running excessively, increasing the intensity of your routine or by not taking proper breaks. Running on unpaved roads or loose dirt can also stress your limbs, resulting in bruising. Bruising can occur if you strain or tear muscles or ligaments in the calf by stretching or stressing them beyond their capability. Calf bruising can also occur if you fall or collide with an object while running. Rest and place an ice pack against your calf to help constrict the blood vessels and reduce bruising and other symptoms. Compress your lower leg with an elastic bandage or sleeve. Elevate your calf to help reduce blood and fluid accumulation and speed up the healing process. If you have to walk, place a heel pad in your shoe to help raise your heel and reduce strain from your calf. Seek medical attention if bruising is chronic or does not subside with home treatment. To prevent additional calf bruising, strengthen your calves with exercises such as calf raises. This will help them better absorb stress while running. Always warm up and stretch out your calf muscles before you run. This will help make the calf muscles stronger, more pliable and less likely to become injured during exercise. Ask a coach or trainer to teach you the proper way to run to help decrease stress on the calf muscles.